CenUSA researcher D.K. Lee has published a paper (Sun Grant funding), Biomass production of herbaceous energy crops in the United States: field trial results and yield potential maps from the multiyear regional feedstock partnership. The paper is open access and available here http://onlinelibrary.wiley.com/doi/10.1111/gcbb.12493/abstract;jsessionid=4380F6D908B04A016742186EE291FF6E.f03t01. Additional information is available here from Science Daily: https://www.sciencedaily.com/releases/2018/01/180116131304.htm. From international consultancy group Bioenergy Crops comes the article "Why bioenergy crops (already) met expectations." The article provides a high level overview of a study published in the open source journal Global Change Biology. The study, Consensus, uncertainties and challenges for perennial bioenergy crops and land use concludes "...there is enough consensus for conclusive evidence that perennial bioenergy crops can mitigate climate change emissions with very high savings of CO2 when cultivated on marginal lands." Find out what our amazing research team is up to with perennial grasses in our latest report. We are so nice we have also provided Executive Summaries! https://cenusa.iastate.edu/reports . The report covers the activities of our 10 research objectives from August 1, 2016 to July 31, 2017. Questions? Contact Anne Kinzel at 515.294.8473. Influential bioeconomy publisher BioFuels Digest identified Iowa as a bioeconomy powerhouse in Hot Spots: 10 Advanced Bioeconomy Places to Watch in Iowa. The article mentions, among others, the Iowa State University's Bioeconomy Institute, Center for Biorenewable Chemicals and Center for Crops Utilization Research as rich assets to drive the state forward. CenUSA collaborator D.K. Lee was quoted in "Climate change may confuse plant dormancy cycles" in the online publication Phys.org. Lee and his research team looked at "the interplay in soil temperature, day length, and dormancy in switchgrass and prairie cordgrass. In addition to the short piece in phys.org you can learn more in the journal article: Jia Guo et al. Growth and Development of Two Perennial Grasses in Ambient Light Conditions during their Natural Dormant Period, Crop Science (2017). DOI: 10.2135/cropsci2016.09.0823. Increased interest and research in biomass and biofuels has promoted the use of biochar, a coproduct of the pyrolysis process, as an amendment to improve soil health. To answer the question whether biochar would benefit home gardeners and grow more productive plants we amended soils at four demonstration sites in Minnesota were with hardwood biochar. With the assistance of Extension Master Gardener volunteers, we grew, harvested and measured common garden crops over four years to see if those grown in biochar-amended soils were more productive. Variables in weather, crops and volunteer interpretation of data did not provide conclusive results. However, the poorer soils amended with biochar showed some increase in soil pH and percent organic matter, and clay loam soils were less compacted. Most crop yields showed improvement over the four years; however, we believe these increased yields were likely affected by a combination of factors (rainfall, air temperatures) and cannot be directly attributed to the addition of biochar. David Laird (CenUSA CO-Project Director) has been named the 2017 Soil Science Society Association's Soil Scientist Research award recipient. He will be recognized during the annual meeting in Tampa in October 2017. Over more than 30 years of professional activity, each area of his work has substantially advanced fundamental principles in soil science and has laid a foundation for subsequent efforts of other scientists. If you are interested in how perennial grasses can be part of a sustainable transformation in Midwestern agriculture you will find this brief article fascinating. Authors Stephen John (Agricultural Watershed Istitute) and Gregory McIsaac discuss how the American Midwest can move from a landscape dominated by row crop production to "multifunctional agriculture" featuring biomass crops. Multifunctional Agriculture: A New Paradigm of Mixed Cropping [Solutions Journal 8(1)66-76 Jan. 2017] is available online at http://ow.ly/VOqB30cEEAU @SolutionsMag. Abandoned strip mine sites may loose their eyesore status if our colleagues at NEWBio — the Northeast Woody/Warm-season Bioenergy Consortium are right about switchgrass. Read "Research focuses on reclaiming strip-mine sites for biofuel crop production" (Penn State News 5/23) and learn more about Marvin Hall's work with switchgrass as a better way of restoring land that had previously been both deep mined and strip mined. It might be possible for producers to create a carbon-neutral production system where poultry bedding would be grown on farm and then harvested for use in the farm's broiler houses. Penn State graduate student Erica Rogers' early results suggest that by following some new practices poultry producers could lower the impact of poultry raising on the Chesapeake Bay. Learn more about this study on bedding alternatives including switchgrass, miscanthus, and willow here. Understand the Consequences." The work was partially funded by CenUSA. NewBio releases fact sheet: "Bipolaris Leaf Spot on Switchgrass"
Our USDA-NIFA AFRI CAP colleagues at New Bio have released a new fact sheet, Bipolaris Leaf Spot on Switchgrass: Bipolaris species. The author is Kittikun Songsomboon with co-authors Dr. J. Hansen and Dr. G. Bergstrom, Dr. D. Viands (College of Agriculture and Life Sciences, Cornell University). The fact sheet details the symptoms and signs, life cycle, and management strategies for the disease Bipolaris infection. Access the fact sheet here. CenUSA Bioenergy's Extension and Outreach Objective has just released a flyer/infographic detailing the work and important results generated by our research and Extension/Outreach teams since August 2011, and yes it's an impressive summary available here. Learn more about corn and switchgrass and their potential for positive co-existance in "Earn cash by establishing switchgrass." CenUSA Bioenergy has released its latest quarterly report covering research and extension/outreach activities between February 1, 2016 to April 30, 2016. Learn what our federally-funded (USDA-NIFA) project has been up to. This report covers the activities of each of our ten objectives, including our Commercialization Objective. Congratulations to Iowa State's "Climate Change, Mitigation, and Adaptation in Corn-Based Cropping Systems" team for being honored by the USDA for their transdisciplinary research, extension, and education projects in nine states to identify strategies to make corn production climate resilient. Learn more about this award here and learn more about this great project . Sometimes people just have enough. The truly motivated take pen to paper which is just what CenUSA Co-Project Director and Director of Iowa State University's Bioeconomy Institute Robert Brown has done. In an op-ed piece in the Des Moines Register (8/31), Biofuels are worse than gasoline? Creative accounting leads to claim, Brown takes to task those who would claim that conventional gasoline is less environmentally harmful than biofuels. Cows and switchgrass: A potential win, win? Is switchgrass a potential feed source for cattle? CenUSA has been investigating the potential of switchgrass as cattle feeding supplement and now we see that our northern neighbors are up to the same thing. Ontario (Canada) farmers Kees and Yvonne Van Esveld have been experimenting with switchgrass as ration supplement in the dairy operation. You can learn more her in this brief article from the Ontario Farmer. Is increased biomass production What do we need to know about increased biomass production? As production of bioproducts and biofuels from agricultural biomass becomes increasingly popular as part of the solution towards to a lower carbon world, scientists must develop a greater understanding of the effects of increased biomas planting. The journal article Biogeochemical Research Priorities for Sustainable Biofuel and Bioenergy Feedstock Production in the Americas*, looks at the gaps in research on biogeochemical processes and ecosystem sustainability related to biomass production. The full journal publication is available free of charge here. A summary is available from Biofuels Digest. June 28, 2016 - CenUSA updates Switchgrass Production Tool. We have updated our Switchgrass Decision Tool. Click here to access the latest version (6/28/16) of the Tool Worksheet. This tool is intended to give producers a guide to understanding best management practices for switchgrass production and also to compare the expected returns to switchgrass production with several alternative land uses. Biochar has always been a big part of the CenUSA vision so we jumped at the opportunity to co-sponsor Biochar 2016: The Synergy of Science and Industry: Biochar’s Connection to Ecology, Soil, Food, and Energy. The event is being put on by the US Biochar Initiative and Sustainable Obtainable Solutions and will be held in Corvallis, Oregon August 22-25, 2016.
Who should attend: are you a biochar producer, farmer, forester, policy maker, industry professional, entrepreneur, student or interested citizen? Then this event is for you. Learn more in the conference flyer or register here. Congratulation to our Minnesota Extension Master Gardener / Citizen Scientists for their "Search for Excellence in Consumer or Commercial Horticulture-Minnesota" award from the National Association of County Agricultural Agents! Preliminary results show biochar had some beneficial effect on certain crop performance in poor (low nutrient) soils, and informally, volunteers observed biochar-amended soils were less compacted. The end of the semester is not always roses, sometimes you have to so goodbye and good luck. CenUSA has had the good fortune of having excellent interns from Iowa State's Greenlee College of Journalism to help us with our BLADES newsletter and social media outlets. This year we have to say thanks, goodbye and good luck to Ali Lenger and Jake Miller. Ali and Jake did an excellent job of helping us publicize CenUSA's work in the emerging bioeconomy and we were lucky to have them as part of our team. CenUSA collaborator Akwasi Boateng and his ARS Sustainable Biofuels and Coproducts Unit at the Eastern Regional Research Center in Wyndmoor, Pennsylvania is hard at work advancing the potential of biomass as a feedstock in the production of bio-oil. Learn more in Bringing up Better Biofuel. Lignin - Is there a market? 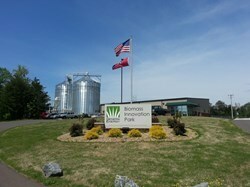 Biofuels industry media heavyweight Biofuels Digest featured CenUSA collaborator Renmatix today. The story features 16 slides that focus on just how this technology licensor sees its clients capturing the bio-based sugar market in Fast & Flexible: The Digest's 2016 Multi-Slide Guide to Renmatix. Lignin has been seen as a bioeconomy problem for a long time. Now, it looks like some young scientists at the University of Tennessee and Oak Ridge National Laboratory's Bredesen Center for Interdisciplinary Research and Graduate Education have come up with a new way to commercialize lignin. Learn about this exciting new approach in Student Startup Turning Heads by Utilizing Biofuel Waste for Good. Is lignin the new special sauce factor for better bioplastics? As article in Biofuels Digest touts the work of Department of Energy Oak Ridge National Laboratory scientists who are helping to crack the 'lignin barrier' currently hampering increased biofuels production. ORNL researchers say they have made a "better thermoplastic" by taking out the styrene and using lignin instead. Learn all about this new thermoplastic called ABL, short for acrylonitrile butadiene in "ORNL researchers invent tougher plastic with 50 percent renewable content." Note: We will be featuring an article in our June BLADES newsletter on the commercial potential of lignin. Congratulations to our NEWBio colleagues at Penn State University on their recent first harvest of 34 acres of fast-growing shrub willow from a Penn State demonstration field. You can learn more in the article "Experimental biomass harvest a step toward sustainable, biofuels-powered future." Click here to read the entire article. From the Great Lakes Bioenergy Research Center (GLBRC) comes the news that an assistant research specialist has found a way to potentially improve the process of producing fuel from switchgrass and other forms of cellulosic biomass using yeast. From the University of Wisconsin's College of Agricultural and Life Sciences comes a story about lignin and its potential to provide value and not barriers. See what scientists at the Great Lakes Bioenergy Research Center are up to in "The Future, Unzipped." inBiofuels Digest (1/21) has a story on the US Navy's efforts to 'green the fleet' in The Great Green Fleet Sails. There are a number of interesting take aways to the story, but getting costs down by a factor of 13 really caught our eye! The new year is for learning. Maybe you will learn something new in this article from the Renewable Energy Network, "17 Answers for Your Burning Questions About Biofuels, Renewable Chemicals, Biomass and More." Read the full article here. The article provides a definition for "marginal land," a topic dear to CenUSA Bioenergy. Switchgrass has a higher calling? We are excited to learn that switchgrass has a higher calling even beyond our CenUSA vision. In fact, this hearty perennial may have a positive impact on the development of future crops. Understanding how microbes promote prairie grasses to grow in nutrient-deficient, marginal soils could have an impact on developing forage and crops, according to researchers at The Samuel Roberts Noble Foundation, the Lawrence Livermore National Laboratory, the University of California-Berkeley and the University of Oklahoma. Read more in "Switchgrass key to future plant hardiness?". The AGRI-VIEW article is freely available here. Is there some biochar in the BLT's future? According to this latest report on the ever-growing uses for biochar, the ubiquitous by-product of pyrolysis can "have considerable advantages for greenhouse tomato growers". But in Brown's assessment, Brown sees a brighter future for biofuels. You can read the full story in "The Fits and Starts of Biofuel" [12/17/15, Laboratory Equipment. The tool is made up of two files, a Tool Instruction Guide (pdf) and the Tool Worksheet (Excel Worksheet). The tool is a collaborative effort by CenUSA's Keri Jacobs, Rob Mitchell and Chad Hart. From the US: "Energy crops and floodplain flows"
Can bioenergy crops add value to the landscape? This question needs to be answered as nations increase their biomass to energy portfolio and the risk of climate change induced flooding grows. "In certain locations, new energy crop plantations could potentially provide a flood risk management function, an economic return and additional environmental benefits." You can read the summary or the full report. CenUSA releases "Guidelines to Growing Perennial Grasses"
CenUSA's Outreach and Extension Team, with the assistance of Co-Project Director Rob Mitchell, has released a new brochure "Guidelines to Growing Perennial Grasses for Biofuel and Bioproducts." The brochure also provides tips on how to reliably establish and successfully manage warm-season grasses. From the USDA comes a report to "An Economic Impact Analysis of the U.S. Biobased Products Industry". This report is a follow-up to the 2014 preliminary study of the same topics. The bioproducts industry contributed $369 billion and directly or indirectly contributed 4 million jobs to the U.S. economy in 2013. Each actual bioindustry job creates indirectly creates 1.64 additional job in the U.S. economy. Certain sectors of the biobased products industry, such as biobased chemicals and “biorefineries”, create between 5 and nearly 20 total jobs for each job directly created. The 2014 preliminary report noted that biobased chemicals could represent 45-50% of the specialty chemicals market by 2025, according to a study by the Organization for Economic Co-Operation and Development (OECD). Jay Staker Earlier has always been a force within CenUSA's Extension and Outreach team so we are not surprised he is being honored by the Iowa Energy Center. As part of the Energy Center's Iowa Energy Summit proceedings, Jay received an Impact Award along with professors Laura Jarboe (Chemical and Biological Engineering), Dr. Sri Sritharan (Civil, Construction and Environmental Engineering). The awards are given to Energy Center grantees that exemplify the Center's mission to support economic development, environmental sustainability, and social well-being for Iowans. "Staker, the State Science and Technology Fair of Iowa board chair, is also the interim director for Iowa Space Grant Consortium. Staker received the 2015 Impact Award from the Iowa Energy Center for his passion and dedication in helping the next generation of Iowa scientists. He was a science teacher for over twenty years and has been with Iowa State Extension for over a decade. While conducting his life’s work, Staker always wondered if there were better ways to help children learn science. He strives to find better methods for teachers, ways to support educators, and most importantly, he tries to find ways for children to actually do science, not just hear about it." To learn more about Jay's contributions to CenUSA via the C6 BioFarm game and app, click here. Learn what CenUSA economists Chad Hart, Keri Jacobs and F.John Hay have to say about the challenges to producers in the short term in this November 6th article "Switchgrass Could Be A Top Biofuel Crop, But It Faces Challenges" from the Yankton Daily Press & Dakotan. Our sister USDA-NIFA Bioenergy CAP Advanced Hardwood Biofuels Northwest (Washington state) has released a new video released by which explains how cellulosic ethanol is being used in the Pacific Northwest by the sustainable hardwood bioproducts and biofuels industry. AHB believes that one day cellulosic biofuels from hardwood could be a cheap fuel produced from locally sourced poplar trees, a better alternative to the region that “importing” corn-based ethanol.. In this article from Biomass Magazine, Building Sustainable Cellulosic Biofuel Portfolios (10/24), author Rajdeep Golecha discusses how switchgrass can be used to diversify a cellulosic bioenergy portfolio. As CenUSA pursues its vision of increased perennials on the Midwestern landscape, we are mindful of the role women will play in the new bioeconomy. The USDA has created a series of infographics that highlights the contributions of women in ag in state-by-state infographics. Learn more in: New WomenInAg Infographics Show Impact of Women in Agriculture in Every State. Iowa says "Bravo to Biomass"
From the University of Iowa news service comes "Bravo to biomass: UI study shows using oat hulls for power has considerable benefits to the environment and human health." (9/24/15). The article provides interesting info on the co-firing of biomass (oat hulls) in the University of Iowa's coal boiler systems, including significant public health benefits. The Iowa City Press Citizen describes the University of Iowa's efforts to use biomass from miscanthus as part of its overall push towards reducing its fossil fuel footprint in "UI ramps up biofuel efforts" (8/26/15). From Midwest Energy News (8/25/15), "The power of willow and switchgrass: Scientists, farmers team up on bioenergy experiment." Learn more about the Argonne National Lab's work with producers to prove the worth of biomass crops. CenUSA Bioenergy's sister project IBSS has released a Guidebook for the Sustainable Production Practices of Switchgrass in the Southeastern U.S.
"[...[ designed to be a practical reference guide for stakeholders involved in the supply chain of utilizing herbaceous energy crops for advanced bioenergy production. The booklet is a guide for the establishment, sustainable management, and harvest of switchgrass utilized as a purpose grown energy crop for advanced bioenergy production." Learn more about the Guidebook here. CenUSA collaborator Emily Heaton is breaking new ground with her work on dedicated energy crops. You can learn more about Heaton's work in the article "Heaton is studying Miscanthus and other dedicated energy crops" published in AgriNews (July 13). See why Heaton thinks "Since the 1930s soybean production has exploded, and I think there's a chance for energy crops to do the same." CenUSA's Mike Casler is featured in an article looking at multiple traits to improve switchgrass. Ethanol Producer Magazine (6/22/15) takes a look at how to move switchgrass from an "excellent biofuel production candidate" to a profitable source of biomass in "Researchers look at multiple traits to improve switchgrass." According to Dr. Casler: "After we achieve the yield and conversion goals, switchgrass could be a significant component of biomass crop grown east of the Rocky Mountains,.. We think we can achieve those goals by 2025." Now available: CenUSA's "Midwest vision for sustainable fuel production"
The CenUSA leadership team has written an article summarizing CenUSA's progress towards its vision since 2011. The article, "Midwest vision for sustainable fuel production" published in the journal Biofuels is now available online. Abstract: This article charts the progress of CenUSA Bioenergy, a USDA-NIFA-AFRI coordinated agricultural project focused on the North Central region of the US. CenUSA’s vision is to develop a regional system for producing fuels and other products from perennial grass crops grown on marginally productive land or land that is otherwise unsuitable for annual cropping. This article focuses on contributions CenUSA has made to nine primary systems needed to make this vision a reality: feedstock improvement; feedstock production on marginal land; feedstock logistics; modeling system performance; feedstock conversion into biofuels and other products; marketing; health and safety; education, and outreach. The final section, Future Perspectives, sets forth a roadmap of additional research, technology development and education required to realize commercialization. WASHINGTON – The USDA Biorefinery, Renewable Chemical, and Biobased Product Manufacturing Assistance Program provides loan guarantees of up to $250 million to construct or retrofit biorefineries to produce advanced biofuels and renewable chemicals. Assistance is also available to eligible biobased facilities that convert biobased outputs from refineries into commercial-scale end-user products. USDA is holding a national stakeholder forum to discuss changes to the program under the 2014 Farm Bill. A national stakeholder forum to announce the new Biorefinery, Renewable Chemical, and Biobased Product Manufacturing Assistance Program (Section 9003), expanding opportunities in renewable chemical and biobased product manufacturing, and application processing and program improvements. The Great Lakes Bioenergy Center has released a study looking at how 'second gen' perennial biofuel crops such as switchgrass and other perennial grasses use water and affect overall Midwestern rainfall balance. The researchers conclude that in a humid Midwestern climate with well-drained soils, perennial use water at roughly the same rate as corn. More information is available from Biofuels Digest Researchers say perennial crops could use same water as corn in Upper Midwest (7/6/15) and from the Great Lakes Bioenergy Center - Perennial biofuel crops use water at levels similar to corn. The article is available here or read the full report. Biofuels Digest (6/29/15) tells the story of a new pubic focused website www.BiofuelsforEurope.eu. The website launched on June 29th is quite interactive and is intended to provide the interested public with summaries of "the latest science on key biofuels issues using fact-based, understandable information." Click here to read the article in Biofuels Digest or go straight to the website. Of course, at CenUSA we are not waiting for robot technology. We are sending out scientists today and every day to promote our vision of creating a Midwestern regional system for producing advanced transportation fuels and bioproducts derived from perennial grasses grown on land that is either unsuitable or marginal for row crop production. The USDA is proposing to open up its loan guarantee program to manufacturers who use biomass to make products. Learn about this potentially historic opportunity for the producers of plant based biomass from the New York Times in "USDA Program Promotes Products Such as Plant-Based Bottles." 'It's all in the traits' says CenUSA and USDA-ARS geneticist and feedstock developer Mike Casler. Learn more about Mike's work in "Better switchgrass, better biofuel"
Is it time to make a bet on perennial power? The Rosebud Sioux may be ready BioMass Better Than Gaming’: Rosebud Sioux Elder Pushing Proposal in South Dakota. The Journal of Soil and Water Conservation has published an article by CenUSA project members Pam Porter, Rob Mitchell and Ken Moore. The article "Reducing hypoxia in the Gulf of Mexico: Reimagining a more resilient agricultural landscape on the Mississippi River Watershed" is available free online here. Where is the next generation of biofuels? Harvest Public Media takes a look at the promise of the next generation of biofuels in "Next Generation Fuels Stuck In Neutral." The article which also contains an audio segment is available here. DOE says there are "Green Jobs in the US"
The US DOE has just released a fact sheet, Green Jobs in the US that explains how the emerging bioeconomy, along with many other benefits, is creating new employment in the US. From our norther neighbors in Ontario comes the article, "Livestock Bedding offers markets for miscanthus, switchgrass growers." Read what AgInnovation Ontario has to say about this potential market. For CenUSA's take on bedding read "Switchgrass: Better bedding for broilers?" The Cedar Rapids Gazette reports on how perennial powerhouse miscanthus grown at the local airport will provide biomass for power at the University of Iowa. Read the full article here. CenUSA commercial partner Renmatix announced today that it has acquired existing assets of the former Mascoma corporation’s 56,000 square foot manufacturing facility in Rome, NY. The new Feedstock Processing Facility (FPF) is dedicated to the first step in conversion to cellulosic sugar (from different types of biomass materials) utilizing proprietary Plantrose® process conditions. The FPF opened officially on April 20, 2015, as the third U.S. location for Renmatix. This move creates a secure supply for Renmatix and its development partners at the IPC in Kennesaw, GA., where the second step in production of Plantro® sugars is performed. Learn more about what CenUSA collaborator Jay Staker and his team are up to in "ISU video game shows what it’s like to farm" (Jason W. Brooks, Newton Daily News, April 28, 2015.
t on April 15, 2015) after developing a developed a method to create bioasphalt using cellulosic feedstock. Though asphalt production typically uses crude petroleum as one of the variables, researchers at Iowa State joined forces to develop biorenewable materials. Learn more here. According to the National Research Council the United States is on the verge of a major industrial breakout in biobased chemical. Read the story in Biofuels Digest (April 6). The NRC's full report is available here. Be sure and download the FREE PDF version. At CenUSA we are part of a larger research effort, the USDA's National Institute of Food and Agriculture's bioenergy "Coordinated Agricultural Projects" (CAPs). * One of our fellow CAPs is Northwest Advanced Renewables Alliance (NARA). NARA has created a series of webinars specifically aimed at educators to acquaint the with environmental sustainability research. You can learn more about these webinars and access them here. *Learn more about all six CAPs by clicking here. GLBRC "Toward Ecological Intensification One Prairie Grass a a Time"
According to the Great Lakes Biological Research Center “Switchgrass is a promising biofuel feedstock and represents a kind of halfway point between agronomic intensification and ecological intensification,” says GLBRC doctoral researcher David Duncan. Learn more at "Toward Ecological Intensification One Prairie Grass a a Time." Check out this article from the Department of Energy, Five Harvesting Technologies are Making Biofuels More Competitive in the Marketplace, for the latest on cost-saving biofeedstock harvest technologies. The article is supplemented with infographics and includes information specific to harvesting switchgrass. For biofuels and bioproducts to achieve commercial success there have to be means to achieve commercialization of lignin. From Biomass Magazine (3/5/15) comes news of a conceptual breakthrough. Learn more at "NREL refines method to convert lignin to nylon precursor." The Hill has published, in its Congress Blog the parable "Managing Carbon Like Coffee Cups" by Robert Brown CenUSA Co-PI and Director of the Bioeconomy Institute at Iowa State University. In the parable Dr. Brown discusses the important role that bioenergy can play in limiting carbon dioxide accumulation in the earth's athmosphere. The article is accompanied by a cartoon drawn by Stefanie Dao, and Iowa State University graduate student in studio arts. There is some exciting news in the bioenergy world this morning and it involves our research/commercialization partner Renmatix and the French energy giant Total, SA. You can also learn more in an article from Biofuels Digest in the article "Total makes play in cellulosic sugars, invests in Renmatix, inks JDA". Explore the "The Cellulosic-RIN Revolution"
Biomass Magazine says "Expanded cellulosic fuel pathways have led to a surge of biogas-based fuel credits, and producers are taking advantage of a significant boost to project economics." CenUSA's commercial partner, Renmatix is featured in today's Biofuels Digest 5-Minute Guide. Read the guide. From the Wilkes-Barre, PA Times Leader comes: "A mix of ideas for a common goal." The article discusses the Second Annual Community Conservation Mixer." We are happy to see switchgrass mentioned in the mix. Does your town have community conversations on conservation? Is this a good idea? The controversy surrounding the recent working paper issued by the World Resource Institute (Searchinger and Heimlich) continues to generate response from the biofuel and bioeconomy sector. Read the latest from Biofuels Digest and Brent Erickson (Executive VP, Biotechnology Industry Organization) "Why Tim Searchinger Is Dead Wrong About Biofuels and Land Use." IowaNow reports that University of Iowa researchers have found that switchgrass can help remove PCBs from contaminated soils. Learn more in the article "UI engineers find switchgrass removes PCBs from soils." Biofuels Digest examines how companies maintain relevance in an evergrowing and changing bioeconomy in "The Big Move: How the leap from first-gen to next-gen biofuels companies happens." CenUSA's Robert Brown ranked #70 in Biofuel Digest's top 125 people in the advanced bioeconomy. Click here to learn more. Biomass Magazine Says "Grass to Gas"
CenUSA Coproject Directors David Laird and Robert Brown are featured in "How crop waste could become carbon-negative energy" in the Jan. 27, 2015 issue of Midwest Energy News. Click here for the article. CenUSA Advisory Board Chair Tom Binder recommends this article, "Synchronized peak-rate years of global resources use." Click here for access. What factors influence farmers' thoughts about change? The article "The difficult art of communicating climate change to farmers" sheds some light on how to approach farmers when change is part of the conversations. CenUSA's Jason Hill quoted in New York Times: "New Report Urges Western Governments to Reconsider Reliance on Biofuels"